It's an opportunity to showcase your knowledge of the procedure, establish rapport with your patient, and gain their trust so that they decide to proceed with treatments. You'll want to answer their questions thoroughly and express your expertise in laser tattoo removal. We've gathered the most common patient questions about laser tattoo removal for your reference. Anyone that interacts with a patient – from the receptionist to the practitioner – should feel confident discussing these topics. Looking for a laser tattoo removal treatment? Click here! For most patients, pricing is a factor in their decision. It's important to have confident yet competitive pricing for your services. We recommend having a clear pricing structure that allows you, the provider, to give a fast and simple answer to the patient's questions about prices. It's best to have the consultation focused on the value of the procedure, not what you charge. Once the tattoo is gone, it's gone forever. If you don't like your tattoo, it's a worthwhile expense. For many practices, the minimum treatment session price for an extra-small tattoo is somewhere in the $75 - $125 range. Any price in this range is considered a normal minimum price for a single treatment. By having the minimum price stated, it allows patients to have a rough idea of expected cost before they come into your clinic for their consultation. Some patients may wish to remove a visible tattoo before an event – such as their wedding or enlisting in the military. It's important to establish upfront that tattoo removal is a process that relies on the body's ability to eliminate ink from the skin. It's not unusual for the body to take over a year to completely eliminate ink. Setting expectations clearly upfront allows for patients to be satisfied throughout the experience – rather than feeling as if they were misled. To allow the skin enough time to heal between treatments and the body's immune system to flush away ink, we recommend a minimum of six weeks between laser sessions – and eight weeks for darker complexions. Stacking the treatments too close together can cause damage and permanent side effects to the skin and doesn't allow the body enough time to remove the ink that was shattered at the most recent session. For ideal results, we recommend waiting three months between treatments. Ultimately, as a tattoo removal practitioner, you cannot know precisely how many treatments a tattoo will need to be fully removed. However, you should assess the patient's tattoo for how easily it should remove. It's a common belief that tattoo removal is excruciating, yet most patients say that the sensation of removal is comparable to having a tattoo applied. Common descriptions include the sensation of a rubber band snapping against the skin or bacon grease – basically it's uncomfortable but bearable. It hurts, but it's bearable. When discussing pain with patients, it's important to share with them that there is some level of discomfort, but that they can manage it. It may take some tough love to encourage patients concerned about sensitivity. The most popular numbing method is a Zimmer Cryo 6, which is a powerful chilling machine that blows cold air on the skin before, during, and after treatments. It's highly effective and an asset to busy practices that need a solution that is fast and easy-to-use. Many patients are concerned about scarring from laser tattoo removal – they understandably want their skin to look as natural as possible after they've completed the tattoo removal process. When the proper laser protocols and patient aftercare are utilized, it's very uncommon for a patient to scar from a Q-switched laser treatment. However, it is very common for a tattoo to feature pre-existing scarring from when it was applied. During the initial consultation while you are assessing the tattoo, touch it and see if pre-existing scarring is present. If so, mark it as such in the patient's records and inform the patient that the laser will not eliminate scar tissue, just their ink. There are also some patients that may have a history of keloids and may be predisposed to scarring, which is why it's important to take a detailed medical history of each patient. Reassure your patients that you use proper protocols and a professional-grade system that is safe for their skin. Ultimately, as a practitioner, you'll still want the patient to sign a consent form addressing the risks of the procedure and promote a strong emphasis on aftercare in your practice. Every tattoo removal practitioner will encounter patients that don't want their tattoos removed completely, but rather revised. Yes, you can provide support to patients looking for tattoo revision. Anyone that is a candidate for tattoo removal liked tattoos enough to get inked at one point in their lives. As a practitioner, you'll want to be sensitive to this and not assume which tattoo a patient wants removed or whether they want complete removal at all. We always suggest starting out the patient consultation with the question, "Which tattoo are you looking to treat today?" This question allows the patient to tell their story about their tattoo and discuss their intentions for coming to you. Selective removal patients are looking to erase a part out of a larger tattoo piece. This is a common request for patients with name tattoos. For example, they like the overall design of their tattoo but dislike that it features an ex-boyfriend's name. Patients also request selective removal if their tattoo artist botched the artwork in an area or the tattoo extended further than they wished – they just want certain parts of the tattoo "cleaned up." When performing treatments for selective removal, you likely will need precision to only treat the areas of the tattoo that are desired to be removed – usually firing the laser at lower repetition rates will help when treating these specific areas. Having established relationships with local tattoo shops will be a great asset to your practice. Not only will you likely get patients referred to you by the tattoo shops, you'll also feel confident referring patients to artists that provide quality work for cover-ups, touch-ups, and revisions. We encourage practitioners to not gloss over side effects during the initial consultation – explain the various side effects in full detail. 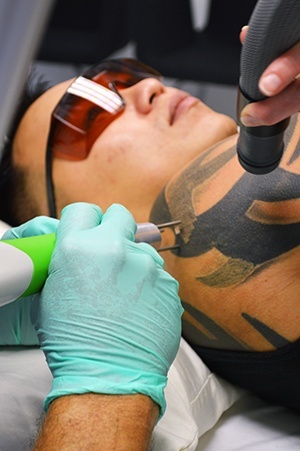 This way, when your patients commit to the tattoo removal process, they're informed and aren't shocked the next day when their skin is sensitive and they are potentially limited from their normal activities or clothing. If all of the proper protocols are used based on the tattoo and the patient's skin tone, all of these side effects are temporary. Redness, tenderness, and swelling typically subside within a day or two following treatment. Blisters usually appear within 24 hours of treatment; sometimes the blisters are very large and may look alarming – this is completely normal. Scabs, bruising, and blistering may take up to a week or longer to heal. Hyperpigmentation and hypopigmentation occur when the body's production of melanin is skewed after a laser treatment. With hyperpigmentation, the body overproduces melanin in reaction to the laser treatment, so skin in the treated area is darker than the natural skin tone. With hypopigmentation, the melanin is depleted by the laser treatment and the skin appears bleached. Both hypopigmentation and hyperpigmentation are typically temporary and resolve naturally with time. Patients with middle to darker skin tones are at the greatest risk for pigmentation changes and should avoid sun exposure the weeks following each treatment. 7. How does laser tattoo removal work? Introduce the discussion of this topic, even if the patient doesn't. 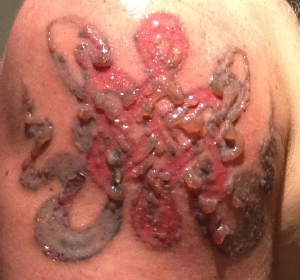 Many patients have the misconception that the laser "burns" the tattoo ink out of the skin. By discussing how tattoo removal works, you can help patients appreciate the role that the laser (and their body) has in eliminating their unwanted tattoo. "Each pulse of the laser sends light energy into your skin. We use different wavelengths of laser light to treat different colors of ink in your tattoo. As the light energy is directed into your skin, it is selectively absorbed by the tattoo ink particles trapped in the dermis of your skin. When the ink particles absorb this energy, they instantly shatter into tiny fragments. Once the laser has broken the ink into smaller pieces, your body's immune system works to remove the ink over the following weeks, flushing it away from the tattooed area. We see the result of this as the tattoo lightening in appearance. Each additional laser treatment breaks down more and more ink until the tattoo can no longer be seen." We've seen that if a patient is informed, they're more likely to continue with treatment until completion, handle side effects properly, and be satisfied with their tattoo removal experience.